The new government and parliament want Polish cities to grow, even if just by letting them merge. According to the Ministry of Internal Affairs and Administration, a draft of a bill that would make the merger of cities easier is to be presented on Feb. 28. A precious collection of stamps and letters from the Warsaw Uprising in 1944 will come back to Poland in March, and beginning in April it will be exhibited by the Museum of the Warsaw Uprising. The Tusk government will be hitting the 100-day mark March 9 – the traditional time for peer review. Has Poland been buying natural gas from the Russian mafia ? Poland’s bagel, the obwarzanek, set for registration on the list of regional products protected by the EU. Poland continues to rank near the top of the EU nations whose citizens are big supporters of the EU. About 1.95 mln Poles lived abroad in 2007, more than double the figure in 2004, the year Polish membership in the EU allowed Poles to begin working in some EU countries. 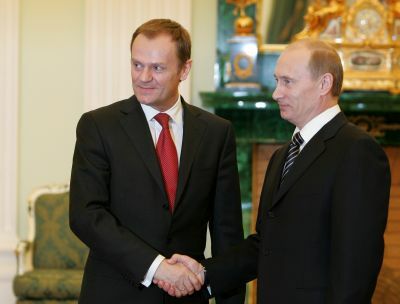 The controversial Nord Stream natural gas pipeline may be a major topic when Prime Minister Donald Tusk visits Russia. Agnieszka Radwanska took another big step on her road to the top of world tennis, this time in Melbourne. The 18-year-old Krakow-based player reached the quarterfinals of the Australian Open, thus recording the best Grand Slam performance in her short professional career. On Dec. 13, 1981, Communist authorities in Poland imposed martial law in order to fight the democratic opposition.